“The committee, which was formed last year, recently hosted a meeting where members were encouraged to commit to prioritizing the creation and promotion of a culture of equity within their companies. “At the meeting, led by D&I Committee Chairperson Kirsten Beasley, ABIC’s objectives and accountability for diversity and fostering a culture of inclusion were shared. Members also discussed results of surveys conducted among member companies and Committee member Claudia Philipsz presented on a proposed D&I approach and framework for member companies. “To give examples of successful initiatives, Lisa Robinson, who leads HR for XL Catlin in Bermuda, shared the company’s vision and approach to D&I, including the design and implementation of a D&I program, and Craig Redcliffe, Partner at EY gave a presentation on the Board Apprentice program. Board Apprentice is a not-for-profit social franchise dedicated to increasing diversity on boards globally. 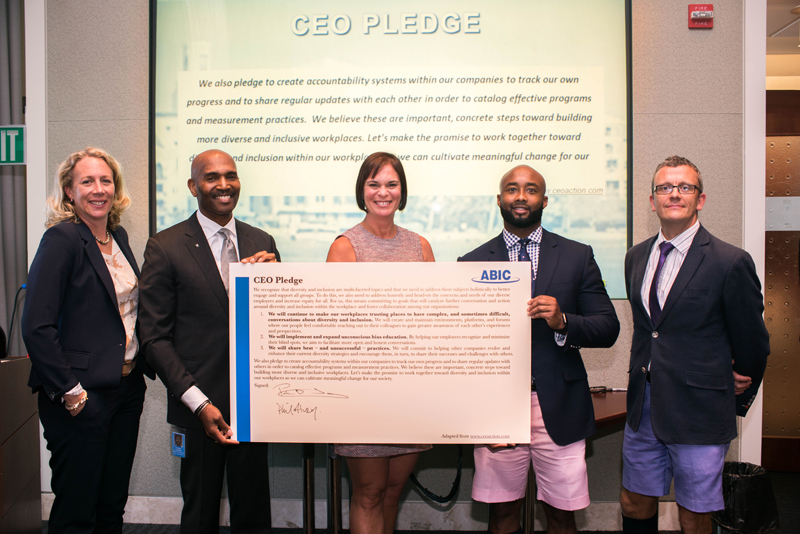 Photo: Several ABIC members recently demonstrated their commitment to D&I within their organizations by reviewing and signing the ABIC CEO D&I Pledge. Pictured from left are: ABIC D&I Committee Chairperson Kirsten Beasley, Head of Healthcare Broking, North America, Willis Towers Watson; ABIC Chairman Patrick Tannock, who is also CEO, Insurance, XL Bermuda Ltd [XL Catlin]; Renee Bullock-Can, Head of Retail Banking and Wealth Management and Marketing, HSBC Bank Bermuda; Michael-Jay Landy, Vice President WNA Bermuda Casualty, Willis Towers Watson and Phil Alvey, CFO, HSBC Bank Bermuda. Emphasizing that in order to be successful, D&I initiatives must be driven from the executive suite, Mr. Tannock said: “Diversity and inclusion is not just a catch phrase, I believe that diversity has the power to be transformational for a company and inclusion enhances an organization’s ability to achieve better results by engaging people from diverse backgrounds and perspectives through participatory decision making. “Executive leadership must lead the charge to change mindsets as to why diversity matters and champion the fact that a diverse workforce measurably improves an organization’s decision making, problem solving, cultural awareness, creativity, innovation, effectiveness and enhances its ability to adapt rapidly and successfully to change. “ABIC will continue to connect and share practical ideas with members to support positive change while highlighting the business case for a diverse and inclusive work environment. The ABIC D&I Committee will also support the Dive In Festival – an annual insurance industry initiative that aims to highlight the business case for diverse and inclusive workplaces and provide practical ideas and inspiration for how to bring about positive change.